While Wordless Wednesday is generally without words… I’m making an exception in honour of poetry month. Yes, I know, every month is poetry month, but let’s not quibble; it’s a good opportunity to share the love even more. Am inspired to this merry lark by an invitation to join the poetry party over at Commatologist, a new-to-me blog, which I have taken an immediate shine to. I chuckled when I saw the arm! What humour, mystery and whimsey it adds to an already reflective photo! Is the arm attached to a body?? What a hoot! I have no idea what or why this is. Wouldn’t you just love to have the courage to ring the doorbell and ask? I was trying to work out what it was in the window till I saw the comment saying it was an arm heheh! OK …enough of that … off to check out commatologist! Thanks, yet again, for the creative giggle, Carin. Are you sorry now that you asked? HA! And just as I was thinking there was no rational reason for a severed arm in a window… you provide a most excellent one. I keep trying to put my own arm in the same position but can’t figure it out. It seems to me that the person had to be facing the wall, which I suppose is possible, but why? And then it also seems sandwiched between two panes of glass. Do you know the explanation, Carin? It’s like one of those Chinese puzzles where you have to untangle things that seemingly can’t possibly be untangled. That’s exactly it, Elizabeth. The thing that makes it screwy. 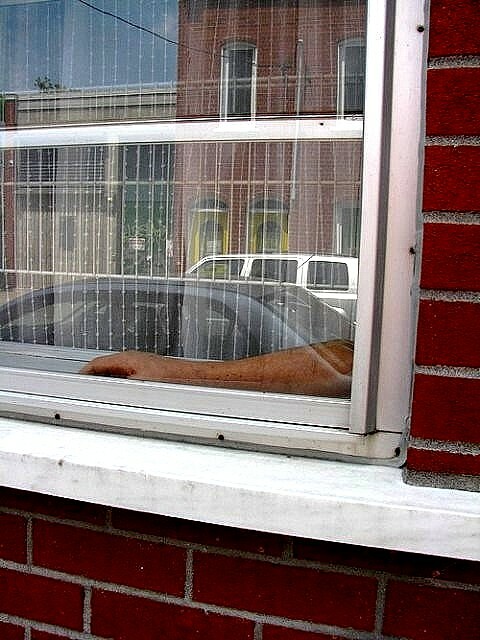 I mean, apart from there being an arm in a window. But the position of it makes my elbow ache. I’m pretty sure the arm–or some body–is waiting for a curious person to ring the doorbell and ask. Unless, of course, it’s a joke on the body who lives there too.